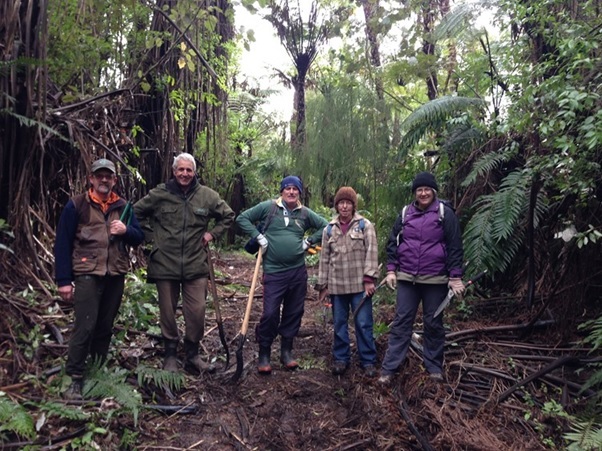 The Kaharoa Kokako Trust (www.kokako.org.nz) and our volunteers have been extremely busy in the last few months. Firstly there was the marking and cutting of new bait station lines and the installation of about 150 new bait stations in preparation for this year’s pest control operation. Then we provided assistance in the capture and translocation carried out by the Otanewainuku Kiwi Trust (www.kiwitrust.org), of 11 adult kokako to augment their existing population. Prior capture of kokako from Kaharoa and Rotoehu had established a small and thriving population at Otanewainuku and these birds were to spread the genetic base. 11 were caught in surprisingly quick time and the activity even found its way onto national television news. For the first time school children were included in this operation representing the local country schools from each area; hopefully encouraging the next generation to continue this work. Finally we have just completed the annual pest control. This involved two weekends of pre-baiting (in the rain), putting out the toxins into the bait stations (in the rain) and finally removal of the uneaten bait (only the odd very light shower!!). In a couple of weeks measurements to determine remaining rats and possums will be carried out which will identify how well this pest management operation went. The forest is full of singing tui, warblers, robins and other bird life and volunteers reported hearing or seeing kokako, kaka and the first of this season’s shining cuckoos. A great time of year to be in the bush and a clear indication of ongoing success which PF Olsen continue to support as a major sponsor. Feeding helps limit trauma after capture, banding and subsequent release. 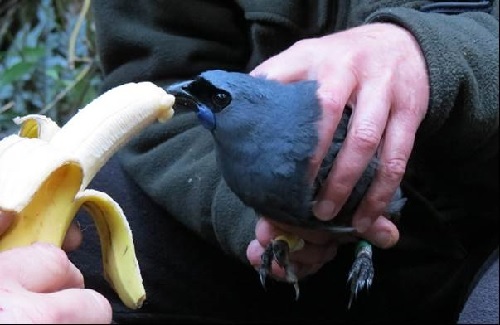 Bananas are a firm kokako favourite! !